Laptop Clipart - Cartoon Laptop Characters - Laptop Mascot Clip Art Cartoon Characters! Cartoon Laptop Clipart - Cartoon Laptop Characters - Cartoon Laptop Mascot Clip Art! Need a cartoon laptop character for your computer, PC, or laptop related website, blog or business? 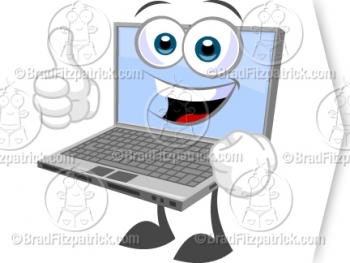 Check out my current selection of cartoon illustrated laptop clipart characters below. If you need this laptop character with a prop or pose not found here, please feel free to contact me here with your specific request. Not quite the cartoon laptop characters you were looking for? I will be adding laptop clipart and mascots resources here from around the web so bookmark this page now and check back soon!